yes, that is "cheeta" from the early tarzan movies with johnny weismuller and maureen o'sullivan. 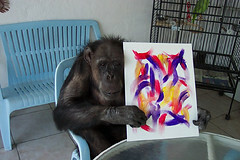 cheeta just turned 75 and he's officially the oldest chimpanzee alive. he loves diet coke and loves to make art. here, he is proudly displaying one of his paintings. we have two good friends who are professors at virginia tech. we found out they are unhurt, thank goodness! but thoughts are on those that did not make it, professors and students. Subject: Re: from Denise Duhamel--are you OK? and wondering how to get over it. to know who I taught who might have died. But this is a small sleepy town so it is a rude awakening. Guns in America is the problem. I'm mad at the extent of the destruction. though I feel vandalized by my proximity and my fear and sadness. Thanks for your kind words. It's been a day here that I'm not likely to forget. Yesterday heavy rain soaked the ground and today high winds are knocking over trees. Four of my neighbor's trees have come down so far. Two of them have fallen into my yard, taking out most of my cyclone fence and knocking electric and cable wires down. All that seemed chaotic enough, and then the news started coming in from campus that there had been a shooting in one of the dorms. At first, it appeared to be a violent incident between two people, and then at noon we got word that twenty students were killedand that news felt like a blow, literally, like being hit by something. Since then it keeps getting worse. Now they have 33 students confirmed dead, and fifteen more in hospitalsand the proportions of the horror, for an essentially small town like Blacksburg, are hard to grasp. I know I feel overwhelmed by itand deeply, deeply saddened. I think the dimensions of the tragedy must make all of us in academe feel like immediate family, because I've gotten dozens of e-mails and phone calls from friends who teach at universities around the country. We all feel it. But a thing like this has a way of opening the heart, too, making one deeply grateful for every bit of friendship and love a life is blessed with. Thanks so much for your concern. I look forward to the next chance I get to spend some time with you and Nick.